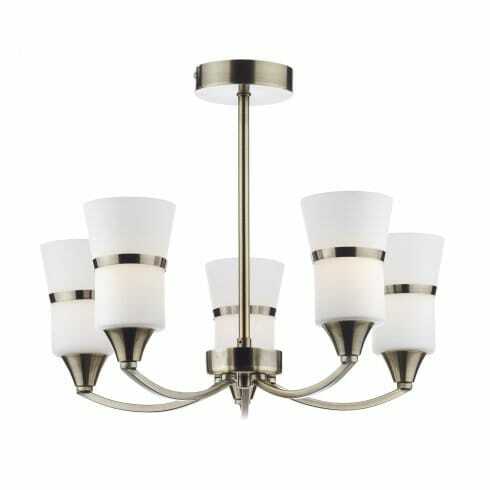 Dar Lighting Dublin medium 5 light ceiling fitting features five bowed, opal glass shades each with a central band of antique brass that compliments the rest of the metalwork. The combination of textures and the simplistic style of the frame creates a contemporary look with a slight classic twist. The product code for this Dar ceiling pendant is DUB0575/LED. Also available as a smaller 3 and larger 8 light semi-flush ceiling fittings, or as a matching single light wall fixture. Alternatively, please continue to browse through our large online catalogue for further inspiration.